Another week, another Eleaf iStick Pico. Alright, maybe I’m exaggerating a bit, but eLeaf certainly knows how to get the most out of its trademark dollars, no? 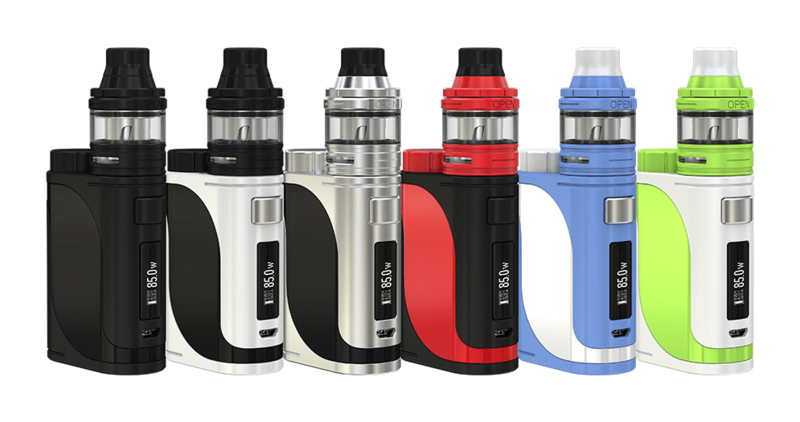 The eLeaf iStick Pico 25, or just ‘Pico 25‘, is the latest, but certainly not the last, of one of eLeaf’s most successful mods. 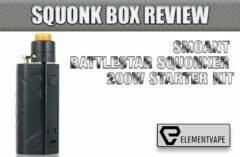 From the company that has produced more iSticks than Duggars have children comes the Pico 25, hot on the heels of the original Pico, the beefier Pico Dual, and the squonking goodness of the Pico Squeeze. 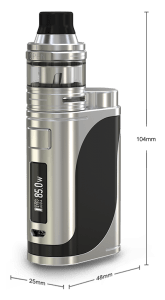 This time around, eLeaf sticks with its literal naming format and brings a wider, but still svelte miniature device with room to accommodate 25mm atomizers. So, is the Pico 25 worth your time and money? Yes, provided you plan on using a different Atty than the included Ello tank. But we’ll get to that in due time. This compact, replaceable single-18650 device is notable for its size alone, as the box boasts some pretty impressive performance specs for a palm-friendly mod. Even on a single cell, the Pico 25 offers up to 85 watts of sub-ohm-ready power, along with a fairly nice list of features which belie its diminutive size. The Pico 25 also continues the series’ legacy of bold, contrasting colors, as my test model came in a striking matte black/candy apple red combination that certainly stands out against my growing collection of black and stainless lookalikes. With such brash color statements, it’s clear eLeaf wants to ensure its products are noticed on vape shop shelves. Perhaps they’re not for everyone, but for vapers seeking the proverbial “something different,” this device certainly fits the bill. In addition to standard wattage, the Pico 25 features a full slate of temperature control options, bypass mode, three memory settings, upgradeable firmware, and even a nifty pre-heat option that works amazingly well for those lower-ohm builds. All of these options are clearly indicated on the device’s bright, legible OLED screen. It’s nothing groundbreaking, but it works well, and eLeaf did a nice job ensuring the menu is accessible, even with the awkward bottom-mounted adjustment buttons. Plus, for those who love extremely low-resolution bitmap art, the Pico 25 also allows you to update the logo to your liking. My black and red model just screamed for a Deadpool logo, and the creative folks on the Pico forums had several to choose from. In mere seconds, eLeaf’s user-friendly upgrade software allowed me to add the logo, where it has remained since I got the device. Like all the eLeaf products I’ve owned or used, the Pico 25 is extremely well-machined, with a streamlined zinc alloy/plastic body, and outstanding, butter-smooth threads. The average-sized fire button feels a little flimsy upon first handling the device, but it is responsive and offers a nice tactile “click” often missing with devices in this category. Plus, there’s no button rattle or unnecessary play when trying to shift it side to side. Again, extremely solid and well-machined. And, at a hair above 143 grams, the Pico 25 offers a fair amount of heft. 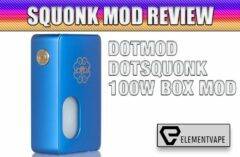 The end result is a mod that feels perfectly weighted, and appears tough enough to withstand considerable wear and tear, from pockets, purses, dings and drops. The only complaint I have about the device design is the placement of the up/down buttons on the bottom of the device. Aesthetically, I always prefer ‘less to more‘. But I also prefer ‘function to fashion’. Though the buttons are recessed, are responsive, and do not make the mod wobbly on flat surfaces, using them is nonetheless uncomfortable. After using – and enjoying – the ALS85 by SMOK, ($46.95 at Element Vape) I feel like this was a questionable design choice by eLeaf. Perhaps this is the price customers must pay for a truly compact device, but even after a full week of using the Pico 25, I still struggle with the awkward movements needed to navigate the menus. Enough prattle – how does it work? The Pico 25 not only performs as well as competing devices from SMOK and WISMEC, but also performs as advertised. 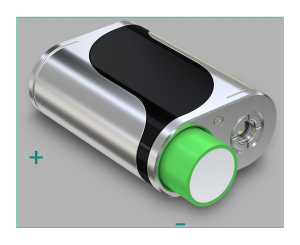 Yes, unlike SO many devices on shelves today, the Pico 25 handles a legitimate 85 watts, on one 18650 battery, with no noticeable power loss or misfires when the cells begin to tire. It’s true that 85 watts is likely higher than its target audience traditionally vapes, but I used the Pico 25 with a 0.15 RDA build, at 85 watts for nearly three hours and didn’t experience one bad puff. The battery life wasn’t spectacular, but taking into mind that this was VERY heavy use at the device’s peak capabilities, I was pleasantly surprised by how steady it was. Under more reasonable circumstances, the Pico 25 exceeded expectations. Switching out a variety of sub-ohm tanks and RTAs, the device never stuttered, with all performing at very high levels, while sitting flush on the press-fit 510 connector. And with 25mm of width to play with, all but your largest atomizers will fit without overhang. During testing, the mod offered a very respectable 6-hour average battery life. Considering the target customers for the Pico 25 likely aren’t heavy vapers, I can see most getting a full day of solid use per charge. Speaking of which, the Pico 25 has the first onboard charging feature I’ve seen that actually works better than an external charger. Using the advertised 2A quick charge feature, the Pico 25 went from near-empty to full in just over two hours via the included USB cable, without excessive heat. .While I’ll always choose external chargers for safety reasons, it’s nice to know I can top off the Pico 25 virtually anywhere, without waiting hours for a minuscule boost in power. The temperature control suite all works as expected – accurately and safely. Perhaps the addition of multiple TCR options was a bit of overkill for an entry-level device, but more-experienced vapers can nonetheless appreciate their inclusion if grabbing one of these to use for a night out on the town. Things were going so well up until this point. But I have to say, the included 25mm Ello sub-ohm tank was a rare misstep in an otherwise impressive little kit. Advertised as a versatile tank that can appease both flavor chasers and cloud fiends (depending on which of the two available coil types you use), the Ello ends up being a markedly average performer on both fronts. 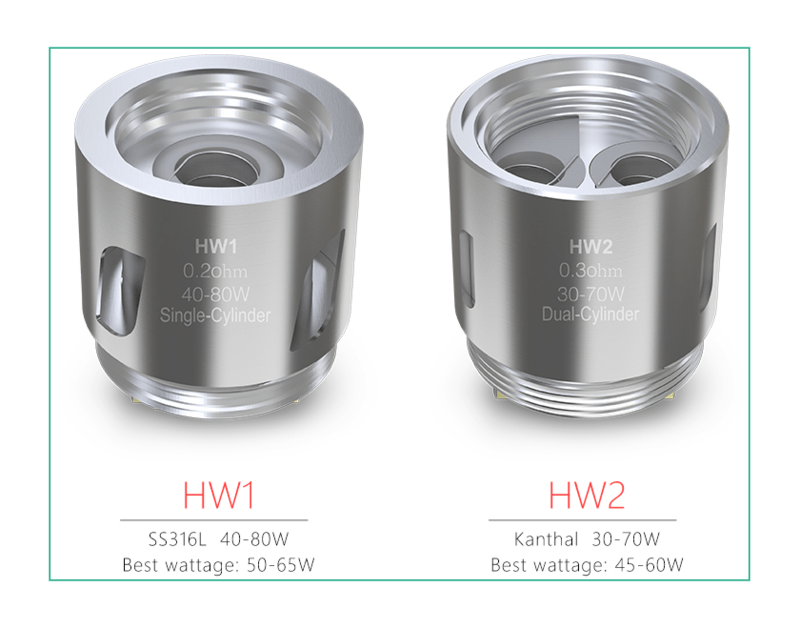 The HW1 0.2-ohm single coil (KANTHAL) is described as giving “decent flavor, good clouds” [Time to hire a more enthusiastic marketing team, eLeaf – Ed.] at a recommended 50-65 watts. The companion HW2 0.3-ohm dual-coil setup (STAINLESS-STEEL) is designed for richer flavor and less-abundant vapor. Neither description was accurate. I put both coils through their paces using a wide variety of wattages, e-liquid flavors and viscosities, and I simply couldn’t tell a difference between the two. Both coils were simply average – far from the worst I’ve experienced, but nothing I’ll be able to remember after writing this review, either. The Ello tank features a clean design that matches perfectly with the look and feel of the Pico 25, but features nothing remarkable or noteworthy, outside of the handy tank extender. Please note that using the extender and larger glass section only mutes the already subdued flavor even further. And despite having more space, the Ello became considerably warmer when extended. I should mention two notable positives. First, the slide-and-lock top-fill setup feels great, and offers and nifty one-handed way to fill via the sizable port. The lock feels strong and hasn’t popped open once without my intending to do so. It’s a natural evolution of SMOK’s rotating fill method, and a welcome one at that. 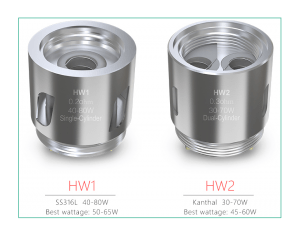 More importantly, despite the overall lackluster performance of each coil, their performance has remained consistent throughout a week’s worth of steady use. Through multiple tanks and temperatures, the coils look as clean as day one, with no drops in flavor and vapor production. The Ello coils may not be the best things out there, but at least they last, which is more than we can say for most replaceable coils these days. Talk about a ceremony of opposites. While the Ello sub-ohm tank is a nice inclusion, its lackluster performance and lack of innovation make it feel like nothing more than a throw-in. With dull flavor and average vapor production, the Ello is the embodiment of “just okay,” which simply isn’t enough when compared with similar tanks. I fear that a new Vaper will only use the Pico 25 with the Ello, simply because they came packaged together. Which would be a shame, because the mod performs infinitely better with more capable tanks and drippers. Though the Pico 25 isn’t intended to replace anyone’s competition mech or DNA device, perhaps the best testimonial I can make is that I found myself reaching for it long after my review notes were done. Even as a guy who prefers the headspace of higher-wattage devices, the Pico hasn’t left my side in more than a week, and I don’t see that changing anytime soon.